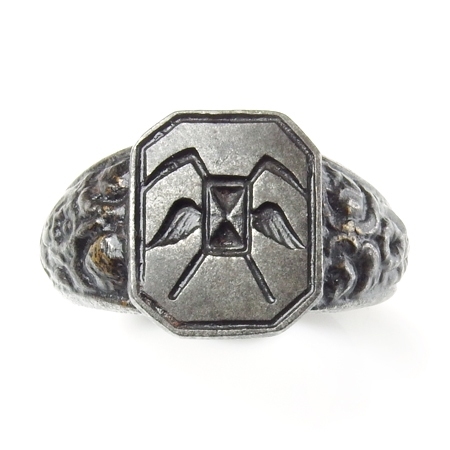 Very rare Berlin iron signet ring with Masonic symbols of a winged hourglass with crossing scythes and a ring band with a floral motif. This unique and large sized ring dates from around 1810-1820, originating from an old German collection. 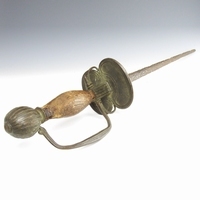 During the Napoleonic wars, the Prussian Royal family urged its citizens to help fund an uprising against Napoleon. Prussian people contributed their precious gold and silver jewellery. In return they were given pieces of cast iron, sometimes a replica of the piece they turned in. Iron jewellery became a symbol of patriotism and selflessness, A popular inscription was 'Ich gab gelt für eisen' (I gave gold for iron). As iron is susceptible to rusting not many pieces have survived. This ring is in very good condition with no visible signs rusting. Care should be taken to keep this ring dry. The ring will be delivered in the ring box, as shown in the pictures.